The Scottish FA showcased their continued support for Show Racism and Bigotry the Red Card’s anti-racism / anti-sectarian messages at the Scotland v Denmark Vauxhall International Challenge match on Wednesday 10 August 2011. 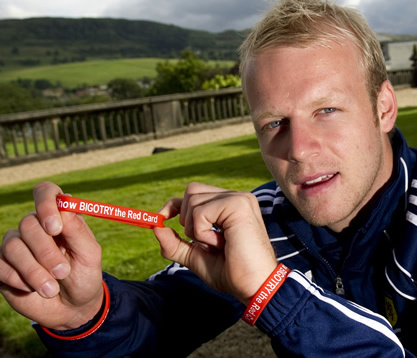 The new Show Racism the Red Card wristband was promoted at the official pre-match press conference, which Scotland and Rangers player Steven Naismith is pictured modelling. Also, anti-racism / anti-sectarian actions were undertaken by mascots and players at the fixture, with anti-racism / anti-sectarian visuals present throughout the game, reinforcing the vital message that there is no place for racism or sectarianism in football or society. All of the above marks the beginning of an exciting few months, with the launch of our new Show Bigotry the Red Card wristband, and preparations get underway for the Fortnight of Action 2011. For the first time ever this year the Fortnight of Action will make a stand against both racism and sectarianism, and see all professional football clubs take action throughout the fortnight. We believe that it is vital to highlight the anti-sectarian message as well as the anti-racism one at this time, when recent incidents have once again highlighted the problem of sectarianism within our communities. The wristbands, along with our other Show Racism the Red Card products, are available in our online shop.